There are many isolated refugee crises around the world. As the crisis in the Middle East spills over into headlines, we look into the recent history of Afghanistan to understand the nature of escape as it has played out in the last thirty years or so; to see how the causes and methods of escape are often complex and heavily contextualised, and how “who” gets to escape is determined by wealth. While the Syrian and other refugee crises are arguably more relevant, we hope to show that escape isn’t simple, and to evaluate its reasons and causes requires time and sufficient contextual knowledge; we hope the current article provides greater insight into the Syrian refugee crisis, as it continues to unfold. In January this year, the UNHCR announced that Syria overtook Afghanistan as the number one source country of refugees for 2014. This statement does two things: it illustrates the wildly escalating situation in Syria (which shows no signs of abating), and it downplayed the nature of Afghan migration. 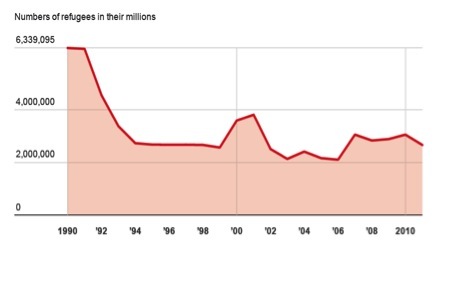 Every year since 1978, Afghans have been fleeing the country. Over the past 25 years, the number of refugees from Afghanistan living abroad has never once dipped beneath the two-million figure. Until this year, Afghanistan was the world’s top source of refugees for 32 years in a row. Examining the past four years yields even more startling results; the figures are erratic, and do not project a predictable stabilising or decrease in the numbers. That means that while some thousands of those two million abroad are returning home, it doesn’t look like a major trend. Even after a formal end to hostilities in Afghanistan, the average number of refugees abroad is well-above that of most other unstable nations. Afghanistan’s recent history is mired in narrative confusion. The grand ideas which precipitated Soviet – and later – American armies to its cities and villages, its deserts and mountains, dissolved. The conflicts on its tired earth have reasons as numerous and scattered as poppy seeds. The nation has been in permanent crisis since 1978 – the year of its revolution. It was supposed to enshrine socialist principles in the nation’s heart – making the secular life glorious by dragging the country into the modern. Tribal practices and religious privilege were to be abolished. Women and minorities were to be given more rights. But it didn’t take. Instead: wars, oppression and terrorism. Conflicts between States and disparate groups of reactionary religious fighters have resulted in the deaths of hundreds of thousands, and the dwindling of minority populations. As well as becoming of key strategic importance during the Cold War, upheavals in Afghanistan’s political landscape created internal sectarian tensions which made conflicts throughout the country unpredictable and messy. "Worldwide, one in every 122 humans is now either a refugee, internally displaced or seeking asylum." The tumultuous decades that followed 1978 are under constant revision by academics; where there is agreement on the date of the revolution, the war with the Soviet Union in the 1980s and the civil war in the 1990s have been harder to describe. Guerrilla warfare and competing objectives made violence erupt for myriad reasons, not necessarily political or religious, including conflicts over land, resources and utilities. While the Soviet Union was officially allied to the government of Afghanistan, fighting against a loose band of organisations and tribes under the banner of the Sunni Mujahideen – parts of which received American training and funding – there is no consensus as to the war’s significance: was it a war in its own right, or was it part of a decades-long civil war? Nasreen Ghufran, Professor of International Policy at the University of Peshawar, for instance, describes the civil war as being a continuation of the initial revolution. In this interpretation, the violence up until the war with America in 2011 was part of a single vast spectrum made up of different phases. Today, while official hostilities with America and the coalition have ceased, Afghanistan is marked by a continuing insurgency in the Taliban and growing unrest. Conflicts and wars merge in a spectrum of undifferentiated destruction. The country has almost enshrined its enclosure on our imaginaries of violence, its recent history only comparable to the Middle East in severity and devastation. Each conflict is complex, related to local as well as national, strategic issues, with multiple actors. The conflicts are distributed throughout Afghanistan. Borders being the only hope for thousands of innocents; but the borders are particularly dangerous. 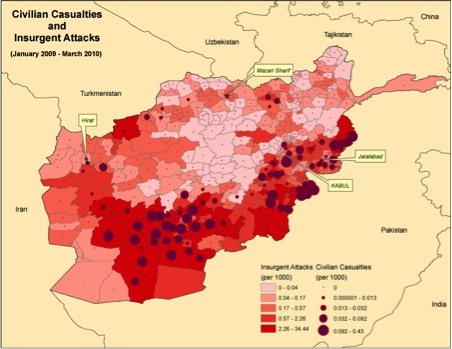 This map displays the location of civilian casualties and insurgent attacks between 2009-10. In truth, it could have been made for any of the years between 2001 until the present. The border with Pakistan is the most dangerous, and still, Pakistan is the main destination for Afghan refugees. Rather than going deep into the causes and the nature of the Syrian conflict, which is as, if not more complex than the Afghan situation, it’s better to look at some of the routes taken by Syrians, and their desired destinations. Camps have been set up in Jordan, Lebanon, Iraq, Turkey and Egypt. Here is a tour of one in Jordan. And here is one which is a gamification of refugee camps, in general. The EU is committed to granting asylum to those suffering persecution or serious harm in their own country, and has its legal basis in the Geneva Convention. Since EU member states share open borders, a joint-approach to refugee issues is considered by national leaders like Francois Hollande and Angela Merkel as imperative to ensuring a robust approach to solving the refugee crisis. The Dublin Regulation is a rule that allocates a single member state of the EU shall determine the asylum application of the applicant; this is to stop asylum seekers from lodging multiple asylum claims. The asylum claims made in Greece by Syrian refugees, however, have come under heavy scrutiny. Where in Afghanistan, refugees had to face a wall of fire at the border, land-mines and drone-strikes, Syrians brave the sea on boats. Here the access to escape has been exploited by smugglers and “experts” who require payment to get people to the boats. The testimony from many Syrians is that the boats are unsafe, the safety provisions non-existent – and many die on the way to Italy. Europe has not proven a safe-haven for escapees of the Syrian conflict; with many people settled in areas of extreme hardship, such as the Island of Kos in Greece, or in Heidenau in Germany; places where anti-migrant feeling is strong, and the EU response has been called the equivalent of dumping. FRONTEX has assessed that nearly half of the refugees entering Europe are from Syria – and many are doing so illegally, through airports. Local politics has made this very messy indeed. This comes at a time when the world is mourning a heartbreaking image of a Syrian kid lying dead on a shore in Turkey. With ragging conflicts in Syria, Iraq and the fears of a Taliban return in Afghanistan, the refugee crisis is taking its toll on vulnerable communities that see escape at any cost to a relatively safe places in the world as the only way forward. But, what if even then their miseries are not over? Afghans; for instance have been living in neighbouring Iran and Pakistan as refugees for over three decades now. 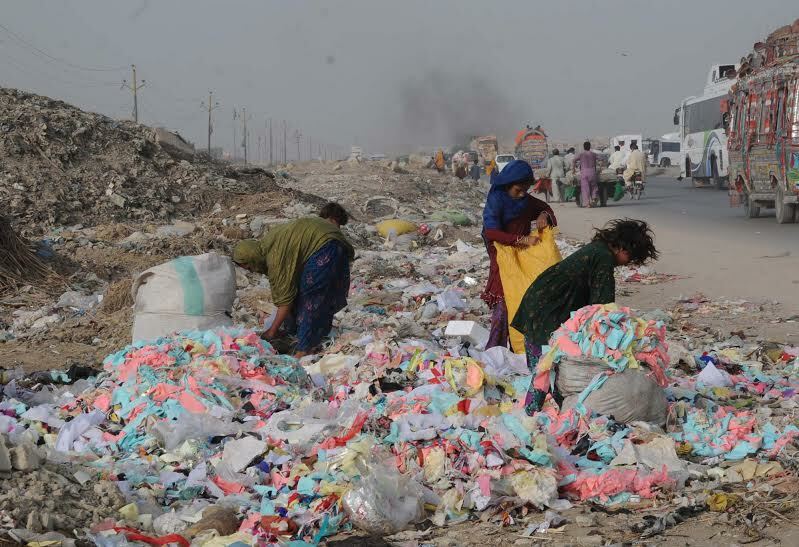 11-years old Khadija, like her two younger sisters and an elder brother, collect recyclable waste on the streets of Pakistan’s financial hub Karachi, seven days a week, for at least ten hours a day. This hard labour that has deprived them of their childhood, education and opportunity to grow as healthy members of the society earns them just enough to make ends meet. Not willing to speak, shy and afraid Khadija just managed to reply to one of Fair Planet’s questions. Why don’t you study instead of working on the streets? “We are poor, what we would eat if we don’t work?” she replied. Pakistan hosts an estimated 1.6 million refugees, most of them Afghans who have been issued Proof of Registration cards by the government while as around one million more Afghans live in Pakistan as unregistered migrants. As the status of their stay has never been decided for good, the refugees live on year-to-year extension granted by Pakistan. A proposal for the latest extension came in August that would allow Afghan refugees to stay in Pakistan for two more years. The decision awaits the approval of Pakistan’s government. “This uncertainty has left us nowhere, our parents came here (to Pakistan) decades ago, many of us are born and brought-up here yet we remain alien and are forced to go back (to Afghanistan) where we have nothing”, Islamuddin, an Afghan refugee living in a camp on the outskirt of Karachi, said. “Pakistan is a Muslim country just like Afghanistan, it is not my fault that Allah decided the faith for me and I was born here, what am I going to do in Afghanistan”, he said while explaining his state of being torn apart between two identities. Islamuddin is not the only one facing this puzzle. Pakistan’s National Database and Registration Authority (NADRA) has blocked some 80,000 ID cards belonging to people with suspected refugee background. As Pakistan’s Army intensified its anti-terrorism campaign following a brazen militant attack on a school in Peshawar that claimed the lives of more than 150 children, authorities have rejected the national identity cards of a number of individuals with a suspected refugee background. Loss of identity means whatever valuables these people posses do not belong to them! Refugees feel they have been stigmatized and made a victim in this regard. Local media often report about Afghans been nabbed by the police in different cities and put in prison on different charges. There have been reports about the law enforcement agencies taking into custody traders with refugee background and confiscating their property. Rifts between the two countries means more trouble for the refugee population. Khadem Husen, Pakistani political analyst believe the refugees truly feel the heat in north western Peshawar city that has border with the tribal area adjacent to Afghanistan. “One can observe on daily basis that most of the Afghan refugees are arrested from various localities, most of them are registered but still they are arrested for being suspected, moreover, even if they are not arrested, they are continuously harassed by the law enforcement agencies everywhere. It seems to be the policy of government to keep the Afghan refugees under continuous pressure for reasons best known to the authorities”, he told Fair Planet. The United Nations High Commissioner for Refugees (UNHCR) recognizes the challenges posed by terrorism and extremism to national security prerogatives; it advocates with relevant authorities not to compromise the genuine humanitarian needs of Afghans who fled conflict and who cannot all return in a short period of time, Duniya Aslam Khan, a spokeswoman for the UNHCR in Pakistan said in this regard. 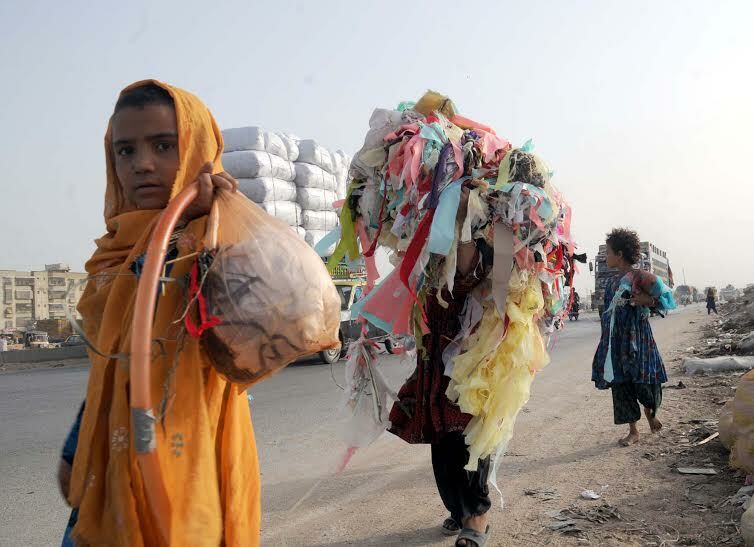 She noted that the prolonged Afghan refugee situation is entering its 4 decade soon, making this the world’s largest protracted refugee population under UNHCR’s mandate. “Since most Afghan refugee households have moved to Pakistan in the early 1980s following the Soviet invasion, the majority (75%) of the registered refugee children and youth have been born in the second or third generation in Pakistan. Some have never visited Afghanistan, lack linkages with their ancestral country of origin and will therefore require strong incentives for return and adequate opportunities for sustainable reintegration”, she stressed. If you are an asylum seeker on your way to Australia via boat, you can only be sure of one thing: that you will never be resettled in Australia. You may arrive in Australian waters to have your boat turned away or towed back to wherever you departed from, or you may be taken to a detention centre in an entirely different country, such as Nauru or Papua New Guinea, where Australia has struck a deal to have you processed offshore, ensuring you never live on Australian soil. Australia’s Stop the Boats operation does exactly as its common name suggests. Known as one of the harshest border policies in the world, is it really the right model for the world’s home of human rights? Five years ago, Australia faced a similar migration crisis to the one facing Europe now. Boatloads of people seeking asylum arrived regularly from Indonesia, where migrants from as far away as Afghanistan gathered in preparation for what they hoped would be the last part of their often months-long journey: a boat trip to Australia. Although the numbers of migrants attempting to enter Australia never reached the number currently fleeing across the Mediterranean, migrant deaths were still frequent. As bodies washed up on Christmas Island in 2010, all parties agreed that something needed to be done. Immigration policy has galvanised elections in Australia for years. In 2012, Prime Minister Julia Gillard commissioned a panel which recommended a series of policy reviews, including a structured pathway for migrants to reach Australia safely, via a stop off in Malaysia. In order to make this process smoother, the panel also recommended reopening detention centres in Manus Island and Nauru, and turning back boats in very specific circumstances. However, it was mostly the asylum-deterring recommendations that were put into practice. And when Tony Abbott’s opposition party ran for election in 2013, they promised to further strengthen these deterrents. They were elected largely on the basis of the ‘Stop the Boats’ campaign. Abbott was ousted by another member of his party last week. After Abbott’s party’s election in September 2013, Australia introduced Operation Sovereign Borders. Human rights campaigners have rallied against the operation and its treatment of asylum seekers ever since. Facing allegations of child abuse in detention centres, and with Amnesty International calling the site in Nauru "a human rights catastrophe with no end in sight", the operation continues among widespread international criticism. The practice of mandatory detention means that people entering Australian waters who claim asylum will be automatically detained while security and health checks are taken. They will only be released when they are granted a visa, or return to their home country. This could happen through force (denial of a visa), but some choose to go home of their own free will. It’s easy to understand why returning to your persecutors is an attractive choice when you see the appalling living conditions in mandatory detention, and how long one might spend there: The Australian Human Rights Commissions reports that the average time a person will spend in mandatory detention is 350 days, but as of June last year, 168 people had been held for more than two years. But these are only the figures for the nearly 4000 people held in detention in Australia. The majority of people claiming asylum are rather processed offshore, where the figures become the responsibility of the third country. This way, the Australian government can keep the latest numbers hush hush because these people no longer arrive on their soil, so the Australian public never has to know just how many desperate people are being turned back, or detained, perhaps indefinitely, elsewhere. Under Operation Sovereign Borders, asylum seekers arriving by boat are held in processing camps in Papua New Guinea and Nauru. A deal signed last September means that those granted refugee status (and therefore released from detention) in Nauru are eventually given permanent resettlement in Cambodia – but that’s not necessarily much better. Many human rights organisations (including the Australian Human Rights Commission) condemn this practice – of shirking international responsibility for people who are legally entitled to claim asylum, and sending them to other countries where the human rights record and living conditions are not of the same standard. And yet it continues. And it’s not only adults exposed – children arriving by boat are detained as well. In February the same Commissions’ Forgotten Children report was released, detailing child abuse in mandatory detention. The report uncovered alarming figures: in a 15-month period, 300 children threatened or exhibited self-harm, 30 reported sexual assault, almost 30 went on hunger strike and more than 200 were somehow involved in instances of assault. The majority of children kept in detention are in Australia, rather than offshore – the report indicated that many of these cases had even occurred on Australian soil. Australian Foreign Minister Julie Bishop recently told press that she had received “numerous requests” from European officials seeking advice on border protection policy during her visit to the continent in April – the month in which a record number of migrants died attempting to reach Europe by sea. But While Tony Abbott outwardly recommended that Europe adopts its own Stop the Boats policy, Julie Bishop stopped just short of that, saying the geographic implications meant Australia’s strategies would not necessarily fit Europe, nor the larger number of people arriving by boat. 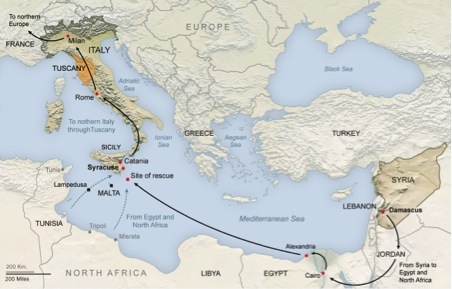 If Europe was to redirect migrants elsewhere, where could that be? Australia has generally targeted much poorer nations nearby who enjoy payoffs from the trade. Furthermore, could EU leaders really justify the huge investment in detention facilities offshore rather than focusing on domestic investment, settling willing and able migrant workers who could ease the economic pressure of an ageing workforce? But those are merely practical concerns. The biggest question rests in morality: could Europe really cope with the shame? In 2001, Australia refused entry to the Norwegian ship MV Tampa, carrying 438 asylum seekers, which resulted in a diplomatic dispute with Norway. The asylum seekers were mainly Hazara, fleeing persecution in Afghanistan, who had been rescued by the Tampa crew after their boat got into distress. The Norwegian government condemned Australia’s refusal in the strongest terms, reporting them to the United Nations, as well as UNHCR and the International Maritime Organisation for failing to comply with their international legal obligations. After days at sea with many suffering dehydration, some dysentery, the majority of the migrants were eventually settled in Nauru and New Zealand after Australia immediately introduced harsher border protection laws in an obvious effort to keep these people out. Nauru or New Zealand – I know what I’d choose. This was the beginning of the ‘Pacific Solution': redirecting asylum seekers to other nearby nations. Norway is not currently a member of the EU, but it does belong to Europe. The Norwegian reaction to this desperate situation was a clear indication that what Australia did (or didn’t do) was not good enough. Could they tolerate a similar response from their European neighbours? With a reputation for spreading democracy and human rights to the rest of the world, could Europe really do that to itself? It is not publicly known precisely what the island nations receive in exchange for accepting Australia’s unwanted asylum seekers. But it is increasingly clear just how far the leaders of these nations will go to keep the deals running smoothly. In May the Nauruan government confirmed that it had blocked Facebook, a main source of information for locals about the asylum seekers detained on their island. In lieu of local press reports, which already tended to ignore the issue, asylum seekers had been using social media to report on their own living conditions. Now how would anyone hear them scream?